Being a parent of an infant or toddler is a wonderful, and yet at times, exhausting role. It’s tempting to get food prepared for the kids, and worry about yourself later, particularly if you have a picky eater. However, research shows that families who share most mealtimes together raise kids who are healthier – both physically and emotionally – and who do better in school. As soon as your baby is eating solid foods, it’s a good idea instill the habit of eating together as a family, particularly given the vocabulary advantages for preschoolers who eat with their parents and siblings. Moreover, Research from the University of Missouri published in June 2010 revealed that adolescents who ate protein-rich breakfasts (containing eggs) better controlled their appetite throughout the day and ate fewer total calories. Mealtime is a particularly good source of rare word use. It’s a very interesting, juicy place to get stories, explanations, discussions about words. Mealtime conversations tend to be longer. Any topic can come up –what we did last week at the amusement park or the asparagus that we’re eating. There’s a broad range of topics that can come up at mealtimes that wouldn’t necessarily be introduced in other kinds of settings. * Less Risky Behavior and Better Relationships: Kids who frequently eat with their families are more likely to avoid cigarettes, alcohol, marijuana, and illicit drugs, and were less likely to be depressed. Teens were more motivated at school and had better relationships. 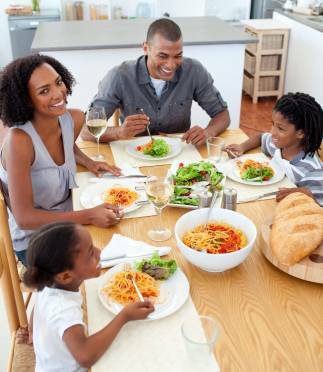 * Communication: Most importantly, meal times provide opportunities for open communication between parents and children. In addition to the benefits above, communication fosters improved parent-child relationships. * Avoid eating meals or snacks in front of the TV, even if it’s educational programming. Kids, like adults, tend to eat mindlessly while in front of a video, increasing the likelihood of overeating. If my kids insist on a snack during their video time, I’ll give them fresh veggies to munch on. * Don’t stress about trying to be the perfect Mom or Dad: the meals don’t have to be fancy. The key behavioral and academic benefits of family meals are driven by conversations and time spent together. * Mix up your conversation topics; get beyond “how was your day.” Keep the topics enjoyable for everyone, but don’t shy away from using “rare” words. Perhaps plan an upcoming event together. Another idea for older kids is to discuss news. As teens, my mom would scan the morning paper as my brother and I got dressed, and pick out a few stories to discuss over breakfast. Not only did this keep us informed of global news, but she has since revealed that she used these articles to reinforce good and bad behavior: the newspaper is often filled with examples of poor choices getting punished and good choices being rewarded. Entry filed under: Emotional Intelligence, Health, Language, Social Skills. Tags: academic achievement, academic performance, behavioral problems, communication, conversations, family meals, mealtime, nutrition, obesity, tests, vocabulary.